It is generally known that Spotify is the best music streaming service right now. It has a library of millions of songs and a massive number of playlists created by users and their editorial team. 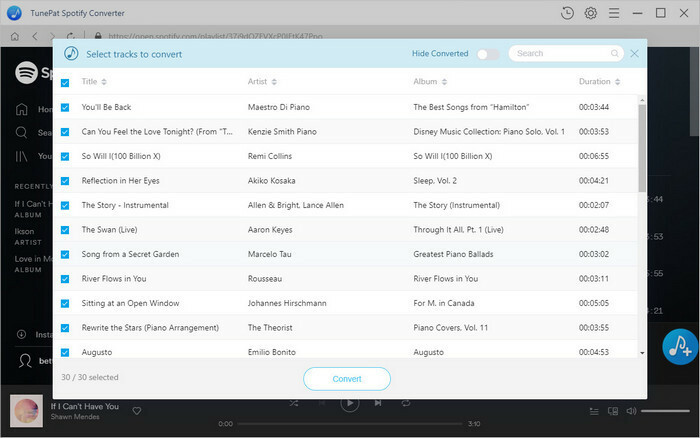 Besides that, users can access podcasts, video content and Pandora-like radio stations. Spotify is a freemium service; basic features are free with advertisements or automatic music videos. And it also has two paid Premium plans: the $9.99 one-person plan and the $14.99 family plan. With Premium subscriptions, you can download albums, playlists you follow, playlists you create, and podcasts and listen to them offline with improved streaming quality. Why We Want to Download Spotify Playlist to MP3? With Spotify Premium, you can only download albums, playlists and podcasts, single track's downloading is not allowed. In addition, Spotify songs are encrypted with DRM copyright technology, which prevents Spotify users playing without Spotify client. What was worse, when you cancel Premium subscription, the offline files are not available any more. In order to play Spotify music freely, we can download Spotify playlist to MP3 or other common audio formats. Just following this tutorial, you can learn how to download Spotify music and playlist to MP3 for offline playback without Premium. 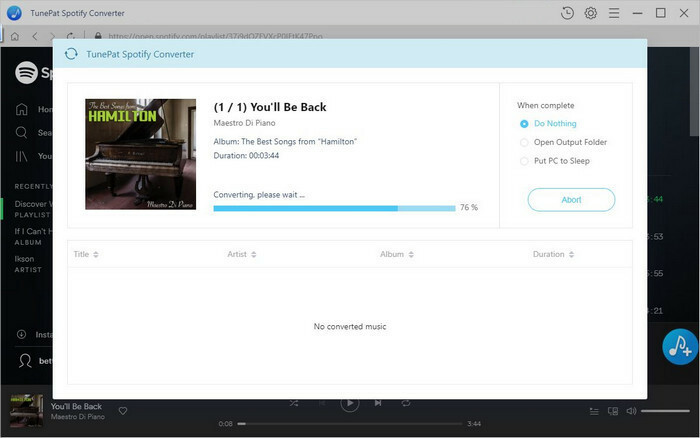 TunePat Spotify Converter is an all-in-one Spotify to MP3 Downloader you can not miss. With it, you can easily download single song, full album or playlists from Spotify and convert them to MP3, AAC, WAV and FLAC with high output audio quality. It is different from the other Spotify Converter on the market: to use it, just log in your Spotify account and select Spotify Music you want to convert. There is no need to install Spotify app. It can help you to convert Spotify tracks and playlists to MP3 at up to 10x faster speed and with ID3 tags kept. Download Spotify tracks, playlist and albums to MP3. Easy to use; Simple and innovative user interface. Up to 10X faster speed; Preserve ID3 Tags. 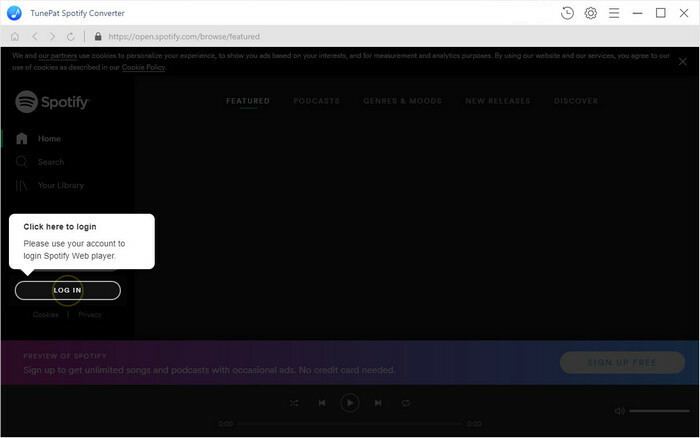 In this following guide, we will be focusing on the Windows version and show you how to easily download Spotify music to MP3 format at up to 10X speed. 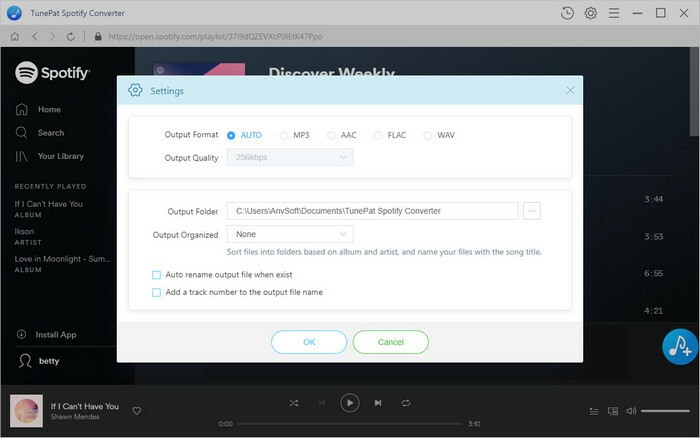 Install and Launch TunePat Spotify Converter on the PC, then log in with your Spotify account. To set output format, you can click gear icon on the toolbar. Apart from MP3, you can also select AAC, WAV and FLAC as output format. You can also choose Output format, Output quality, Output Folder according to your own needs. Select the songs you want to convert, then click Convert button, the Spotify music to MP3 downloading process will begin automatically. After the conversion process is complete, you can locate the downloaded Spotify music in the history folder. Now you can enjoy any Spotify songs anytime and anywhere.